Cute and sweet, this bouquet of Gerberas and Lilies will definitely impress. 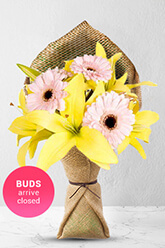 To ensure long life, the flowers may arrive with some closed buds which will soon open as fresh blooms and create a lasting impression.Lilies may be sent closed/partially closed in order to prevent damage and to last longer.Vase not included however; our past customers have preferred a Premium Vase to complement Cotton Candy. Easy, excellent, quick service, quick checkout. Recipient loved their flowers and I loved how I could deliver on the same day I purchased!! Super quick delivery and beautiful flowers. Will definitely use again! Great thank you and efficient. Thank you zFlowers.com. The delivery was made to the Recipient who informed me that the flowers were beautiful. I will use you again in the future, Much appreciated, Colette. I placed my order just after 2pm and was delights that it was still delivered the same day. Great choice of flower combination and freshness. Need to improve delivery time especially during weekend. I have been told that the flowers have been delivered but, because I live 500km away, I have not seen them. I did not get any delivery notification from you. If I had, I would have rated higher.